Someone brought to my attention that I never made a formal announcement that the Paleo-Future blog has moved to http://www.paleofuture.com. Well, consider this my formal announcement. 8 months later. I turned off comments on this site because it was becoming a garbage heap of spam. But worry not! You can still comment on all Paleo-Future posts, both old and new, at http://www.paleofuture.com. The Paleo-Future blog will be switching to a new platform soon, so make sure to update your RSS feed, smoke signal reader, or whatever your preferred source of paleo-future goodness. Provided I don't tear some kind of hole in the paleo-future spacetime-blanket, I'll see you on the other side. 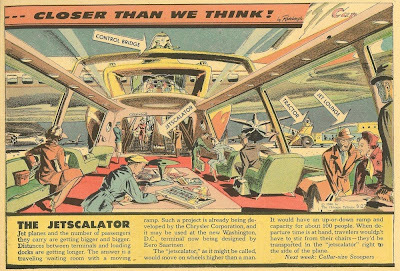 The March 1, 1959 edition of Arthur Radebaugh's Closer Than We Think! featured "rejuvenated downtowns" of the future. I travel the United States often imagining what the downtowns of our major cities once looked like. Few American downtowns are thriving, or barely surviving. The downtown of the city in which I live (St. Paul, MN) is certainly struggling. Good luck finding much open past 5PM. Radebaugh's mention of downtown Detroit is particularly jarring for our 2009 eyes. The recent photo essay in Time magazine titled, "The Remains of Detroit" really says it all. I recently picked up the book Downtown: Its Rise and Fall, 1880-1950, which appears to shed some light on precisely what happened to the American urban center. The text from "Rejuvenated Downtowns" appears below. Thanks again to Tom Z. for the color scans. Traffic-choked downtown sections will be rejuvenated and transformed into airy, wide pedestrian malls when the designs of city planners are adopted in a none-too-distant future. Large-scale plans and programs are springing up all over the country. One example is fashionable Lincoln Road in Miami Beach, being studied today for conversion into a traffic-free shopping promenade. Another is utilitarian Woodward Avenue in downtown Detroit. There are many more in between. Traffic will be parked in adjoining areas. Store fronts will be modernized and beautified. New lighting at night and newly planted trees, shrubs and flowers will give these malls an exciting air. The aim is to regain for downtowns their former status as urban headquarters. The December 6, 1931 Daily Capital News and Post-Tribune (Jefferson City, MO) ran a short blurb about Francis Keally's predictions for the city of 2031. Keally (1889-1978) was an architect who worked on the Oregon state capitol building in Salem, which was completed in 1938. Francis Keally thinks that our future cities will spread out over great areas like monstrous eagles. One hundred years from today we shall have no batteries of skyscrapers to point out to our trans-Atlantic visitors. On the contrary our future cities, because of the aerial eye, will be flat-topped, and two out of every three buildings will serve as some kind of landing area for a super-auto gyroplane or a transcontinental express. What towers there are will be built at a great distance from the airports and will serve as mooring masts for giant dirigibles. The architects of our future aerial cities may have to go back to places like Constantinople and Fez for their inspiration of these future flat-topped aerial cities where one finds a low horizontal character to the entire city, occasionally broken here and there by a praying tower or a minaret. 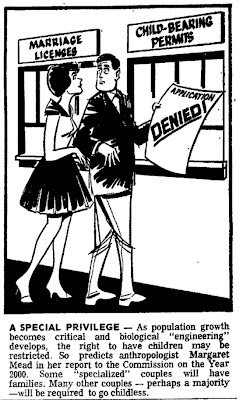 Francis Keally also had an idea in the August, 1931 issue of Modern Mechanics for glass banks. 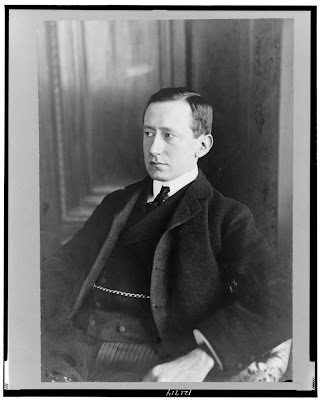 Did you raise a toast to William Marconi last night? How about Robert Fulton? Not even the Wright brothers? Well, this piece in the September 26, 1909 New York Times thought you would be doing just that in twenty-oh-nine. With this year of our city, 2009, epochmaking, eramarking celebrations have come and gone - centennial exercises in honor of Henry Hudson, Robert Fulton, the Wright brothers, William Marconi, and other pioneers of last century's strides in science, industrial and otherwise. It is the second time in our city's history that two weeks of her varied life have been given over as a mighty tribute to those men who marked the beginnings of great inventions, improvements, discoveries, and of applications which have for their result the amazing facilities for live and living afforded in this year of grace 2009. The celebrations just ended not only mark the close of another great chapter in the history of New York; they have been an episode in the story of the universe. In the celebration pictures we find the aerovessel, almost absent from the celebrations of 1909, crowding in upon the vision as cabs did around the old-fashioned theatre one hundred years ago. We find the aerovessel in its many forms - from the single-seated skimmer to the vast aerocruisers, of which the Martian type is perhaps the finest example - equivalent to the Dreadnaught of the ante-pax days. Also, we perceive along the sea coast and on the Hudson River a type of vessel which was not foreshadowed even at the time of the first centennial celebrations - the submarine and flying skimmer, in playfully sobriqued the "susky-marine." Of course, the gradual elimination of earth and ocean surface travel made it inevitable that the submarine aerovessel should have a monopoly of the earth and the waters under the earth. It is hardly necessary to recall the case of the last of the old steel warships, the Amerigo, which foundered in 1947 and all souls after having been split by the Flying Diver (Jupiter: 2d class: 10 v. c.) as the latter shot from the ocean bed to the air leap. Fun House has posted some fun images from the 1962 World's Fair in Seattle, which was also known as the "Century 21 Exposition." 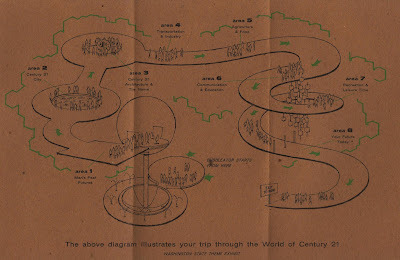 The image above is a map which "illustrates your trip through the World of Century 21." 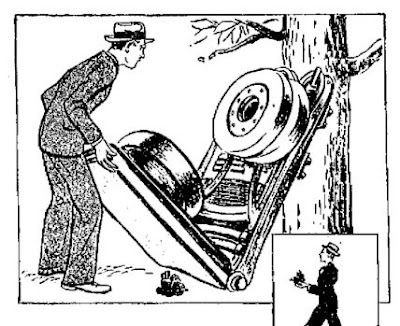 The November 26, 1939 San Antonio Light (San Antonio, TX) featured this prediction of the fold-up car of the future. Even the young man of the scientific future may find trouble, one day on the road, with his sunpower automobile. He gets out, tips up the car with one hand and looks underneath. Finding what seems to be the trouble, he unscrews a few clamps, takes out the engine, and starts off jauntily to the repair shop, as though he were only carrying an alarm clock. Strong muscles? Not at all, merely a lightweight engine. Next day he comes back for the engineless car, folds it up like a collapsible baby carriage, loads it on the most convenient high speed bus or aero bus, takes it home and tucks it away in any handy closet until the engine has been repaired. These are not Professor Harrison's predictions, but they are made possible by one of his, that of stronger metals. What requires so much weight in automobile engines or bodies, in giant bridges, in the steel frames of buildings and a thousand other things is that much metal must he used to make the beams or castings strong. Weight Itself is useless. Need is only for strength. "Great strides have been made recently," Professor Harrison writes, "in the physics of metals—the study of how atoms cling together to form crystals and these crystals hang together in metal rods and wires. All metals are permeated by microscopic cracks and flaws which greatly reduce their strength. "If only Ihe crystals of which they are composed would hang to one another with the forces with which the individual atoms cling together! Then a cable of steel an inch thick would safely support four million pounds, instead of the mere 300,000 pounds which it now will held." Such metals 13 times stronger than now can mean not only lighter engines and folding, fly-weight auto bodies, but also taller buildings, longer bridges, faster airplanes, larger ships--or deadlier machine guns and farther-ranging submarines. 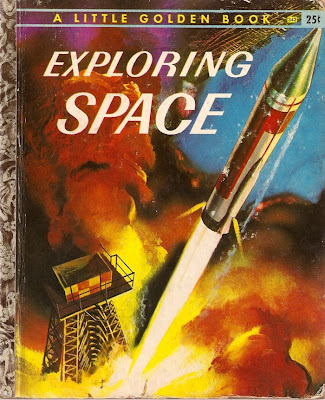 While The Complete Book of Space Travel was aimed at teen and pre-teen boys, the 1958 book Exploring Space was looking for a younger audience (still of boys, mind you, since we all know that lady-parts get confused with all that science and math). Below are sample pages from the book, including one that some little tyke got after with a brown crayon. While some scientists are trying to find out how to land rockets safely, others are learning what kinds of suits space travelers will need. They pump air out of a room, so it is like space. 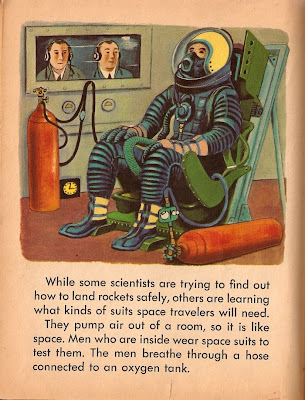 Men who are inside wear space suits to test them. The men breathe through a hose connected to an oxygen tank. 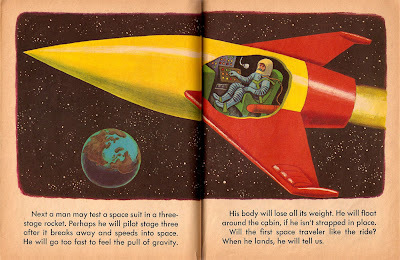 Next a man may test a space suit in a three-stage rocket. Perhaps he will pilot stage three after it breaks away and speeds into space. He will go too fast to feel the pull of gravity. His body will lose all its weight. He will float around the cabin, if he isn't strapped in place. Will the first space traveler like the ride? When he lands, he will tell us. Other men will follow the first space traveler into space. They will test bigger and bigger rockets. 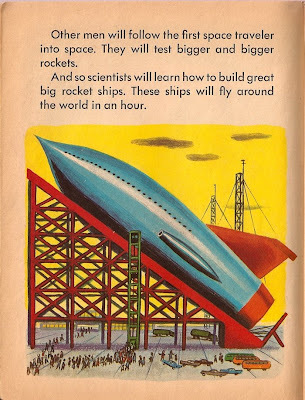 And so scientists will learn how to build great big rocket ships. These ships will fly around the world in an hour. 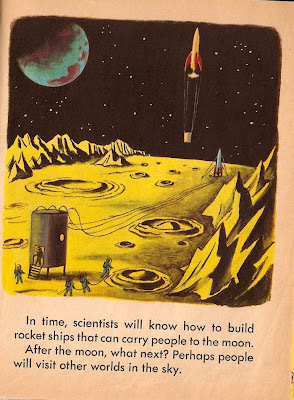 In time, scientists will know how to build rocket ships that can carry people to the moon. After the moon, what next? Perhaps people will visit other worlds in the sky. 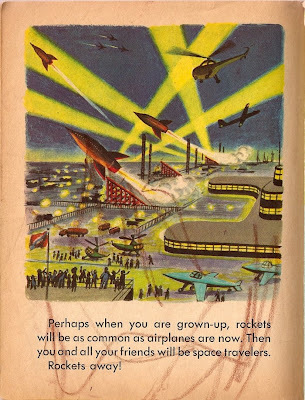 Perhaps when you are grown-up, rockets will be as common as airplanes are now. Then you and all your friends will be space travelers. Rockets away! 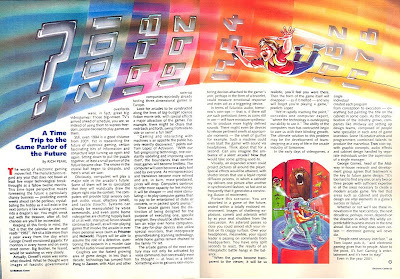 This two-page spread from a 1982 issue of Electronic Games magazine is pretty spot on with many of its predictions. However, being "chained to the family TV set" isn't such a big deal when Little Johnny Future now plays on a 72-inch monster TV. Thanks to Paul H. for sending this article my way. The world of electronic gaming moves fast. The manufacturers regard any year that does not boast at least five major technological breakthroughs as a fallow twelve months. This time-lapse perspective makes foreseeing the future a particularly chancy business - predicting events weeks ahead can be perilous, crystal-balling the hobby as it will exist in the next century is like walking, unarmed into a dragon's lair. You might sneak out with the treasure, after all, but chances are you'll be incinerated. Keeping all this firmly in mind, the fact is that the calendar on the wall reads "1982." We sit a little more than a year away from the day when George Orwell envisioned gigantic TV monitors in every home and on every street corner. Big Brother, he feared, would be watching us very closely. Actually, Orwell's vision was somewhat clouded. What he though were images of fascistic governmental overlords were, in fact, great big videogames! Those big-screen TV's arrived ahead of schedule, you see, so instead of using them to supress [sic] freedom, people decided to play games on them. Obviously computers will play a major role in the arcader's future. Some of them will be so specialized that they will realistically draw the player right into the contest. The computers will provide total sensory output: audio, visual, olfactory (smell), and tactile (touch). Systems can already be manipulated by voice commands, and even some home videogames are chatting happily back at us as well. Interactive fiction should continue to do well, as will role-playing games that involve the arcader in ever more personal ways (such as Prisoner and Network). Players will be able to assume the role of a detective, questioning the suspects in a murder case with full audio/visual accompaniment. Graphics are the fastest growing area of game design in less than a decade. Technology has jumped from Pong to Zaxxon, with Atari and other coin-op companies reportedly testing three-dimensional games in Europe. Look for arcades to be constructed along the lines of big-budget science fiction movie sets, with special effects a major attraction of the games. For example, there might be chairs that rock back and forth, swing from side to side or swivel a full 360 degrees. "Gaming and interacting with machines is an appetite the public has only recently discovered," points out Tom Lopez of Activision. "With our fast-progressing technology, one constantly updating and improving upon itself, the boundaries that confine most games will become limitless. The computer will soon become a daily tool used by everyone. As microprocessors and transistors become more refined and are, in turn, mass-produced, prices will drop. Computers continue to offer more capacity for less money. It will be cheaper - and more stimulating - to play computer games than to pay to be entertained at clubs or concerts, or in packed sports arenas." Since arcade games have the distinction of being designed for the purpose of executing one, specific program, they should be able to maintain an edge over home computers. The pay-for-play devices also utilize special monitors, that incorporate groundbreaking scanning technology, while home games remain chained to the family TV set. The arcade games of the next century may not only be activated by voice command, but conceivably even by thought - at least in a sense. Something akin to galvanic skin-monitoring devices attached to the gamer's arm, perhaps in the form of a bracelet, could measure emotional response and even act as a triggering device. In terms of futuristic audio, tomorrow's coin-ops - that is, if there still are such prehistoric items as coins still in use - will have miniature synthesizers to produce more highly defined sounds. There might even be devices to release pertinent smells at appropriate moments - the smell of gunfire for example. Such a machine could even blast the gamer with sound via headphones. Think about that for a second. Can you imagine the ambiance of a silent arcade? Now that would take some getting used to. Visually, an expanded screen could project pictures all around the player. Special effect would be attained, with shutter lenses that use a liquid crystal diffusion process, in which a cathode ray delivers one picture after another in synchronized fashion, so fast and so frequently that it generates a convincing illusion of movement. Picture this scenario: You are absorbed in a game of the future, seated within a totally enclosed environment. Images of shattering explosions, comets and asteroids whirl by as your seat shudders from the concussion. An asteroid passes so close you could almost etch your initials in its craggy surface. Over your headphones, meanwhile, your squad leader is passing on commands from headquarters. You have only split seconds to react, the results of an intergalactic battle hangs in the balance. "When the games become transparent to the viewer, it will be so realistic, you'll feel you were there. Then the form of the game itself will disappear - as if it melted - and you will forget you're playing a game," predicts Lopez. "We're rapidly reaching the point," concedes one computer expert, "where technology is outstripping our ability to use it." The ability of the computers man has constructed begin to awe us with their blinding growth. The ultimate solution to this problem may be the development of team-designing as a way of life in the arcade industry of tomorrow. 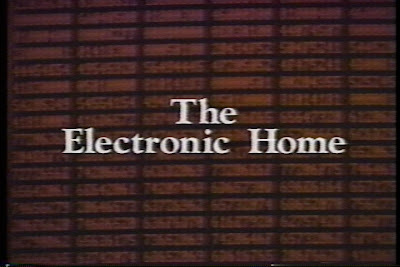 In the early days of videogames, a single individual created each program from conception to execution - everything but painting the title on the cabinet in some cases. As the sophistication of the industry grows, companies like Midway are setting up design teams, composed of people who specialize in each area of game invention. Some 16 creative artists and programmers combined talents to produce the marvelous Tron coin-op, with graphic concepts, audio effects and cabinet design handled by separate individuals under the supervision of a single manager. George Gomez, head of the Midway in-house research and development group agrees that teamwork is the key to future game design. "It's too hard to find any one, or any two or three people with sufficient expertise in all the areas necessary to create a modern arcade game. We feel that areas such as cabinet and joystick design are vital elements in a game's success or failure." Whether or not we'll see these innovations in the next century, the next decade or, perhaps, never, depends on the direction in which this wildly unpredictable business moves in the time ahead. But one thing does seem certain - electronic gaming will never die. "People need sensory interface," as Tom Lopez puts it, "and electronic gaming gives that to people. More to the point, it's fun! Gaming is entertainment and it's here to stay!" Even in the year 2001. I haven't yet read Mac Montandon's book Jetpack Dreams, but thanks to this video it's made its way to the top of my book heap. Jetpack Dreams Trailer from Mac Montandon on Vimeo. Labels: books, jet pack, mac montandon, where's my jetpack? 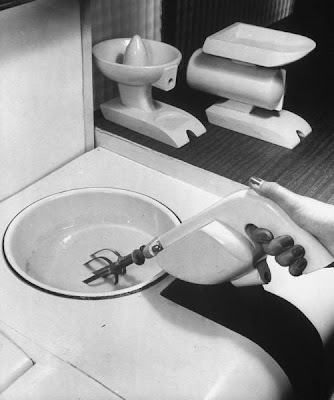 It's interesting to compare this vision of the future kitchen with that of 1967. Both are messages from companies wishing to sell a lifestyle of post-war consumerism as much as the products themselves, it seems. TOLEDO, O. 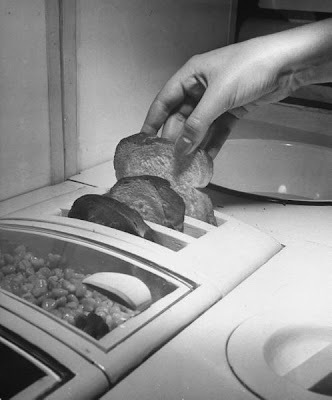 - The "Kitchen of Tomorrow" that does everything but put out the cat at night now makes its debut. 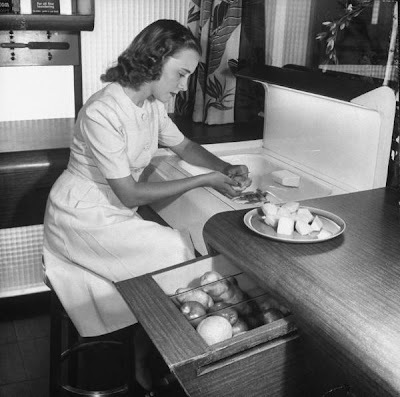 Sore feet will be only a memory of the sad past—because in this kitchen three-quarters of the "little woman's" work can be done while comfortably seated. With a minimum of effort it converts to extra living space—with all of the familiar kitchen '"gadgets" and appliances buried from sight. 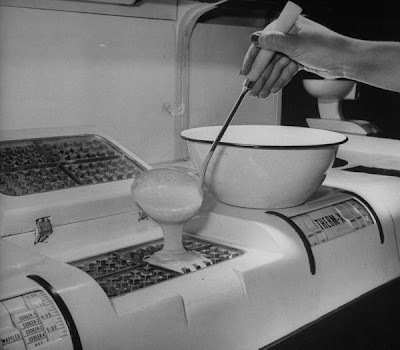 Designed by the Libbey-Owens-Ford Glass Company to help point the way toward more practical and gracious living in the post-war era, the kitchen has an "all this and heaven, too" theme developed by the use of easily obtained and familiar materials worked into new shapes and forms. 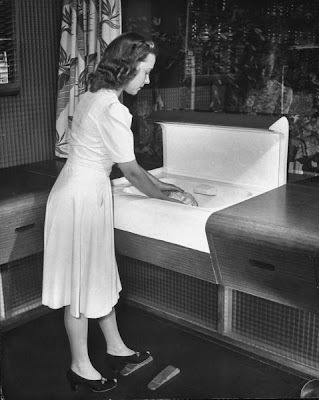 An "out of this world" refrigerator of glass construction has four times the capacity of today's model. Built on the principle of the cold storage locker, it is separated into compartments, each with an individual temperature control. One compartment shelf revolves—so that salads and often-used foods can be placed in it from the kitchen side and removed from the adjoining dining alcove. All of the kitchen equipment has been raised to an easy working level and the space ordinarily cluttered with storage bins and cabinets has been left free to provide room for the housewife's knees. And not overlooking a thing, H. Creston Doner, designer of the kitchen, turned out a model dining alcove, as a "running mate" for the kitchen. He pointed out that, other than making the ideas of his department available to other designers and manufacturers, his firm's sole interest is to demonstrate some of the decorative and utilitarian advantages of glass. Well Medicated recently compiled a number of paleo-futuristic images (mostly stolen from the always-excellent blog Modern Mechanix), including this one from the December, 1958 issue of Popular Electronics magazine. 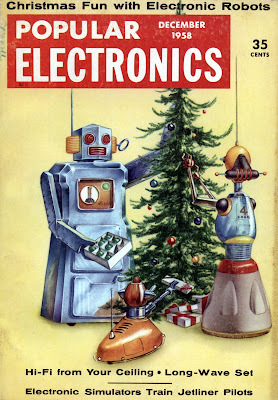 The robot family of the future sure is adorable, putting up their Christmas tree and all. If you recall, Parade magazine had a more terrifying depiction of the robo-dog of the future back in 1959. If you love this style of robot, might I recommend the tremendous artwork of Eric Joyner? A delight for all robots, big and small. A special thanks to BoingBoing and Jeremy for the heads up on this robo-family find. 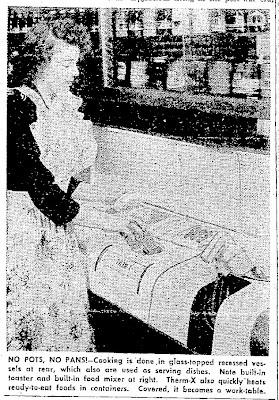 The January 29, 1939 Hammond Times (Hammond, IN) ran this piece about the super-fast airplanes of the future. The article quickly devolves into a debate about how trustworthy air speed indicators are. WASHINGTON, Jan. 28 -- Airplanes capable of flying nearly 1,000 miles an hour - 300 miles an hour faster than the speed of sound - will be developed "within a generation," federal aviation engineers confidently predicted today. This prediction, carrying with it tremendous military and commercial implications, was made while the same engineers were expressing "some doubt" that the plane flown in a test dive last Monday at Buffalo, N.Y., actually reached the reported speed of 575 miles an hour. A spokesman for the national advisory committee for aeronautics, which conducts government aviation research at its vast Langley Field, Va., laboratories, said that while NACA tests thus far have not developed speeds on assembled models of above 500 miles an hour, there is no incontrovertible reason to believe that a modern airplane can not attain a 575-mile-an-hour clip. "The basis on which we entertain doubt regarding the 575-mile-an-hour speed at Buffalo is simply this: The air speed indicator in the planes showed 575 miles an hour, but it has been established that air speed indicators cannot be trusted too far," he explained. "In order to have been accurate, the indicator in the plane flown at Buffalo should have been adjusted at different levels on the way down during the dive. That, of course, was impossible." The The Kids' Whole Future Catalog really is a treasure trove of 1980's futurism. 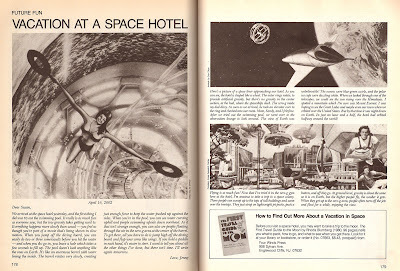 Today we have a letter from Jenny, writing her friend Susan about the amazing space hotel she's visiting in the year 2002. Having graduated high school in the year 2002, I'm a little disappointed that my graduation ceremony wasn't held at a space hotel, complete with space pool and the accompanying physics that go along with that. We arrived at the space hotel yesterday, and the first thing I did was try out the swimming pool. It really is as much fun as everyone says, but the low gravity takes getting used to. Everything happens more slowly than usual - you feel as though you're part of a movie that's being show in slow motion. When you jump off the diving board, you can easily do two or three somersaults before you hit the water - and when you do go in, you leave a hole which takes a few seconds to fill up. The pool doesn't look anything like the ones on Earth. It's like an enormous barrel with water lining the inside. The barrel rotates very slowly, creating just enough force to keep the water pushed up against the sides. When you're in the pool, you can see water curving uphill and people swimming upside down overhead. As if that isn't strange enough, you can also see people floating through the air in the zero-g area at the center of the barrel. To get there, all you have to do is jump high off the diving board and flap your arms like wings. If you hold a paddle in each hand, it's easier to steer. I want to tell you about all the other things I've done, but there isn't time. I'll write again tomorrow. The March 18, 1920 Cedar Rapids Evening Gazette (Cedar Rapids, IA) declared that movies would help future generations better understand the past. This piece has striking similarities to 1920's predictions of movies replacing textbooks. The piece is also interesting to read side-by-side with "Big Laughs Coming" from the Modesto Evening News in 1922. Every moving picture is a contribution, for the benefit of posterity, to the history of our time, its manners, its customs, its thoughts, its virtues and its follies. To the schoolboy of the year 1995 history will not merely be something to be memorized out of books. It will be visualized and made real for him by the moving pictures that are being made now. The people of our time will not be mere history book ghosts to this boy but living creatures who smile at him and walk and play and love and hate and work and eat. If only we had today moving pictures of the times of Washington and Lincoln! Imagine a Fourth of July celebration with moving pictures of the signing of the Declaration! The historical value of moving picture plays will be as great as that of movies of current events. The 1920 photoplay exhibited in the year 1995 will serve as an exposition of the social life and manners of this period. And, despite its faults, the present generation will make a fairly good showing when it appears in the movies before posterity in 1995 and thereabouts. The schoolboys of that time may laugh at some of the ways of their ancestors, but, in the main, they will agree that they were a pretty good sort at that. These French cards, archived at the Library of Congress, were produced sometime between 1890 and 1900. 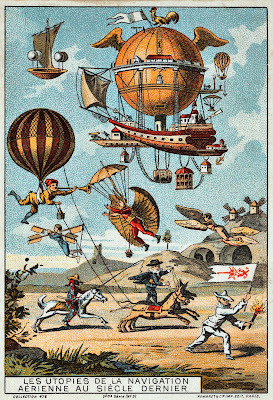 Most of the cards illustrate important feats from ballooning history between 1795-1846, while card number two (pictured above) depicts futuristic visions of flight from the 1800s. It's striking how similar these imagined flying machines are to those we looked at from 1885. The Paleo-Future Store features button sets of those paleo-futuristic flying machines from 1885, which you can check out here. 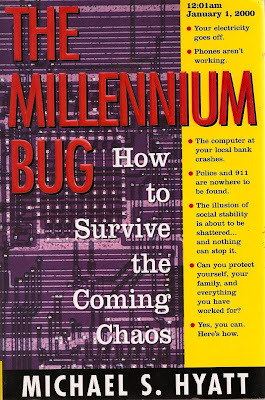 The 1998 book The Millennium Bug by Michael S. Hyatt is pretty pessimistic about mankind's future, given the "Y2K problem." Ironically, Mr. Hyatt blogged more recently about cynics who are pessimistic about the future. He says that real leaders "look on the sunny side." Priceless turnaround. As ridiculous as the hysteria over Y2K may have been, it was certainly more palatable than the current "2012" nonsense. Whatever happened to being afraid of a good, old-fashioned robot uprising? My favorite warning from the front cover of the book says that the "illusion of social stability is about to be shattered . . . and nothing can stop it." If this is even remotely true, why buy this book? Do you feel as if you're living with the "illusion of social stability"? Might we all crack in a moment's notice? Does every generation feel so special as to believe they live in the End Times? Social security checks will stop coming. Planes all over the world will be grounded. Credit card charges will be rejected. Military defense systems will fail. Police records and emergency communications will be inaccessible. There will be massive, long-term power failures. Bank funds will be inaccessible. Insurance policies will appear to have expired. Telephone systems will fail to operate. IRS tax records and government funds will be unavailable. The Federal Reserve will be unable to clear checks. Time security vaults will fail to open or close on time. Traffic signals will fail to function. 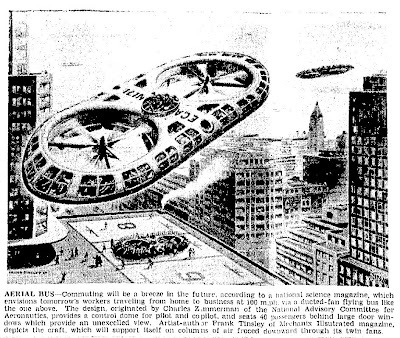 The October 22, 1957 Chillicothe Constitution-Tribune (Chillicothe, MO) ran this image of a flying bus of the future. Commuting will be a breeze in the future, according to a national science magazine, which envisions tomorrow's workers traveling from home to business at 100 m.p.h. via a ducted-fan flying bus like the one above. The design, originated by Charles Zimmerman of the National Advisory Committee for Aeronautics, provides a control dome for pilot and copilot, and seats 40 passengers behind large door windows which provide an unexcelled view. Artist-author Frank Tinsley of Mechanix Illustrated magazine, depicts the craft, which will support itself on columns of air forced downward through its twin fans. 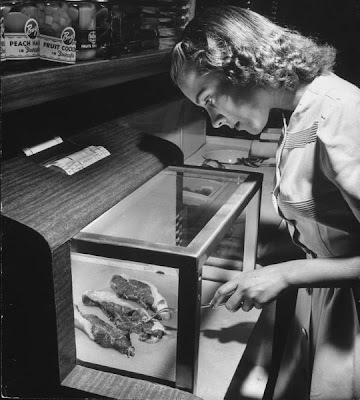 We've looked at plenty of predictions about how, in the future, we'd all be eating meal pills. 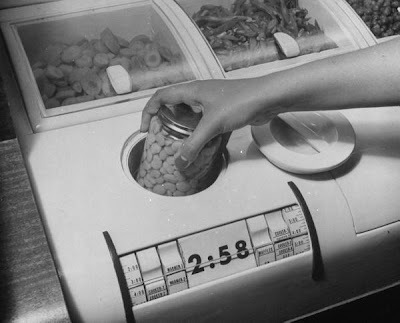 From turkey dinners to beer to tutti-fruitti, it was a question of when we would enjoy them in pill form, not if we would. 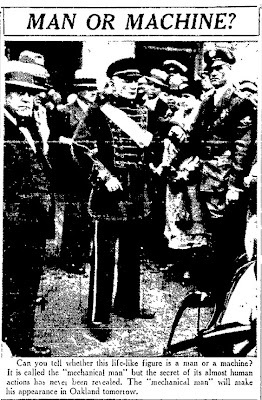 But in the October 6, 1936 Jefferson City Post-Tribune (Jefferson City, MO), Dr. Milton A. Bridges rains on the meal pill parade. The entire piece appears below. KANSAS CITY, Oct. 6 - (AP) -- Alack and alas, the hardworking housewife must give up her dream of dispensing with a four-course meal by simply feeding hubby a concentrated food pill -- it can't be done, an authority said today. The calory factor will necessitate continued operation of America's kitchens, explained Dr. Milton A. Bridges, assistant clinical professor of medicine at Columbia University and dietitics authority. "Human beings never are going to eat pills for meals," said Dr. Bridges, emphatically. "Pills can never be made to contain sufficient caloric volume." Caloric volume, the quantity of calories, is a factor of daily diet that must be kept to quota, Dr. Bridges explained. "It is perfectly plausible to supply all the vitamins and minerals needed for a meal in pill form. But you can't get calories except by eating foods. "And you'd have to eat the same foods we eat now to get those calories," added Dr. Bridges. These foods, if the diet is properly balance, will provide the other necessary elements at the same time, Dr. Bridges declared, making the pills just so much surplusage, as far as the normal appetite is concerned. Dr. Bridges is attending the annual fall conference of the Southwest Clinical Society. This CTWT has held special significance for me (and anyone else who has used Dulles until quite recently). I haven’t flown in years, but I understand that the famous “Mobile Terminals” are finally gone, a case of a futuristic idea that didn’t work all that well in the real world. The handful of times that I've been through the Dulles airport I've felt that I was going to miss my flight because of those slow moving shuttles. I hadn't heard that they might be doing away with the mobile lounges. Can anyone confirm that this is true? Jet planes and the number of passengers they carry are getting bigger and bigger. Distances between terminals and loading docks are getting longer. The answer is a traveling waiting room with a moving ramp. Such a project is already being developed by the Chrysler Corporation, and it may be used at the new Washington, D.C., terminal now being designed by Eero Saarinen. The "jetscalator," as it might be called, would move on wheels higher than a man. It would have an up-or-down ramp and capacity for about 100 people. When departure time is at hand, travelers wouldn't have to stir from their chairs - they'd be transported in the "jetscalator" right to the side of the plane. Imagine [ten/twenty/fifty] years in the future. Your [car/toaster/robot] speaks to you. No, it's not your [friend/mom/crazy fever dream]. Your life just got better* with technology! 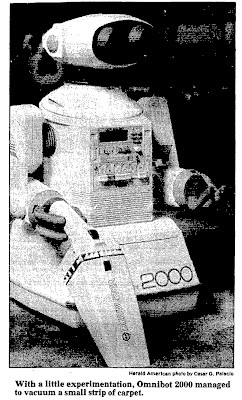 The December 8, 1985 Syracuse Herald Journal (Syracuse, NY) ran a piece about the personal robots of the future which uses this formula. The excerpt below quotes Nelson Winkless, author of the 1984 book, If I Had a Robot. Imagine driving down the highway 10 or 20 years from now. Suddenly, a small voice says, "You haven't called your mother lately. Don't you think you'd better call her today?" No, it's not your conscience. It's your own personal robot, a funny little creature that keeps track of your obligations and watches out for you. Of course, no one really knows what robots of the future will do to make your life easier. But a New Mexico robotics expert and author, Nelson Winkless, expects them to be more than mechanical housekeepers. "Before we have robots that will do windows, we're going to have self-cleaning windows," he said, in a telephone interview from Corales, N.M. "I expect them to be useful in ways yet unanticipated. "Suppose you had this little guy bumbling after you, keeping track of things. You may come to a corner and he'll say, 'Why don't you slow down and watch out here?'" says Winkless, who wrote "If I Had a Robot: What to Expect of the Personal Robot" (Dilithium Press, $9.95). "We have just gotten to the point where we have (robots) that operate intuitively. They look at information and say, 'In all of my experience in life, what does this remind me of most?' They can see opportunities and problems and point them out." Joe Herrera, robot product manager for Tomy Corp., in Carson, Calif., thinks there will be "a robot in every garage" by the year 2000. "One robot for the home may be able to wash your car and tell the kids stories," says Herrera, whose company manufactures robot toys. "Right now, personal robots are in the same stage handheld calculators were 10 years ago. But every year, we're learning more and more." Before starting the Paleo-Future blog I had no idea that weather control was such a prominent feature of mid-20th-century futurism. Raised on Jurassic Park's pop version of chaos theory, I suppose that little Matty was deathly afraid a butterfly beating its wings in Indochina would cause a typhoon in Omaha. And thus, messing with a single little black raincloud would surely cause massive, unforeseen destruction. Ah, the carefree years of our youth. 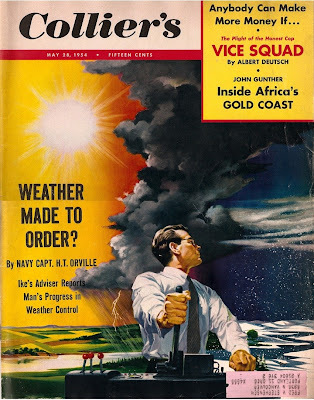 The May 28, 1954 issue of Collier's predicted that mankind (and by that we mean the United States) would eventually have complete control over weather. An excerpt from the piece by Capt. H.T. Orville appears below. "I believe the photo industry will some day eliminate the processing operation as we know it today. They will dehydrate it - that is, take the water and the mess out of it. "Instead of liquid solutions and time and temperature factors, it would be simpler to deal with a radiation or heat process to activate the latent image. "The photograph would take his pictures with an automatic camera, wind the film or sensitized material through a box at home or anywhere he happens to be and out would come the strip of finished negatives, transparencies or prints. It is logically and practical and the trend of the industry thinking is in that direction." The author of the article then seems to mock the very idea with a flippant comment about crystal balls. If you can't buy a camera or processing box like that, maybe you can shop around for a crystal ball. It certainly makes beautiful pictures.